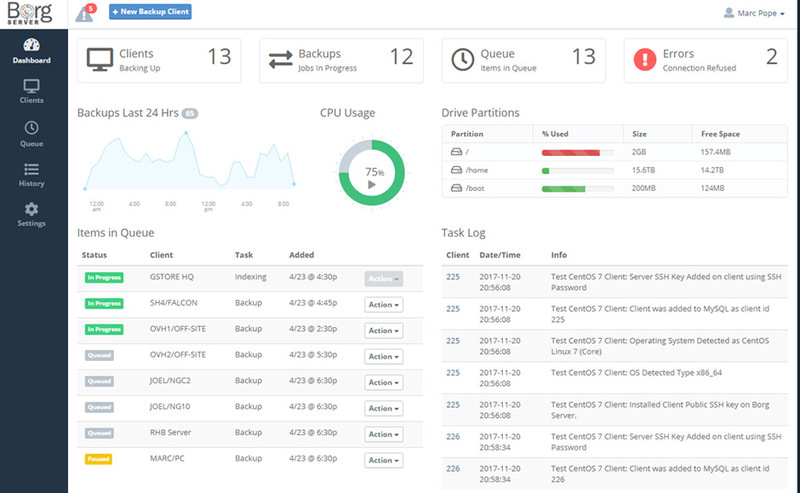 Finally, a server-based management GUI for Borg Backup to backup all your Linux servers from one place. Hi, I am Marc. I have been in the web-hosting and server business since 1995. At my company, we manage 100s of Linux servers. And, if you are like me, backups are a critical part of your infastructure. The problem is Backup Software can be extremely expensive. For our company, we were paying over $750 a month for a popular backup solution. We checked around at other options and were quoted even more for others. Then we came across Borg Backup. Borg Backup is a Linux command-line utility to create backups of your computers. It's de-duplication and speed can't be beat. However, when you are dealing with a large number of machines to backup up, it quickly becomes obvious that you don't have a good way to manage all your client machines from a single place. It's also time-consuming and tedious to setup large number of machines. So, we've created Borg Backup Server. Intuitave GUI - Borg Backup Server features a responsive GUI using Bootstrap, jQuery and PHP 7 (it's even mobile-friendly). Interactive charts and tables show you all the information you need to make sure your backups are running perfect. 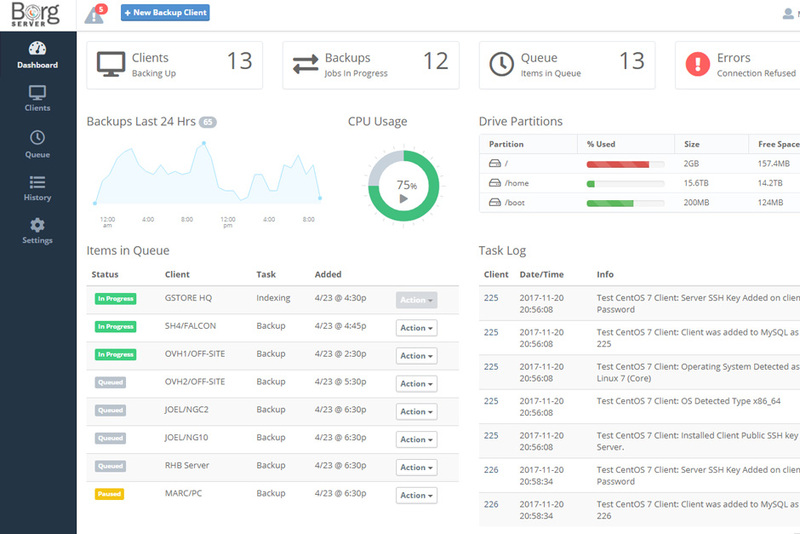 Even if you are backing up 3 or 100 machines, the GUI will give you a quick summary of all your backups. Speed - We built Borg Backup Server to be very fast. Some other backup solutions can bog down and even become un-responsive under certain circumstances. Borg Backup Server does not have this problem and has comprehensive error handling. Easy Client Install - Our installer will connect to your client machine, install the correct Borg client software, and setup public and private keys with just a few clicks. It will even detect what OS you're running. On our client page, you can see at-a-glance if any machines are out-of-date and update them with a single click! Notifications - Get instant feedback of problems with backups, machines that are off-line, and other important information that needs attention. User Permissions - Give your users access to specific machines so they can self-restore and monitor their own data and backups. Strong Security - We take security seriously. Borg's Repo Passwords are stored encrypted on Borg Backup Server so a malicious or hacked client can't delete a borg repository. In addition, the decryption routines are encrypted with Zend Encoder. Each client machine's backups are stored in their own Linux user directory on Borg Server with limited permissions so no client machine can access another client machine's data. Even when a backup is running, the repo password is not exposed in the process list. The Borg Backup Server also is locked down so remote access is limited. Recovery - After each backup, the data is indexed for powerful searching. Compare files between backups to see when a specific file was altered. Securely, restore data back to the client machine, or download your backed up data as a ZIP or TAR.GZ file. Auto Update - Borg Backup Server will auto-update it's core as new releases come out at the click of a button. In addition, Borg Backup Server will update Borg Clients with the latest stable client available. Check back soon for more details and realease information.